In a in compressible and non viscous fluid the mass of the fluid that enters at a given point per second is equal to the mass of the point that leaves in the same time.This concept is valid only when the fluid density is constant and it is not experiencing any viscous forces opposite its motion. 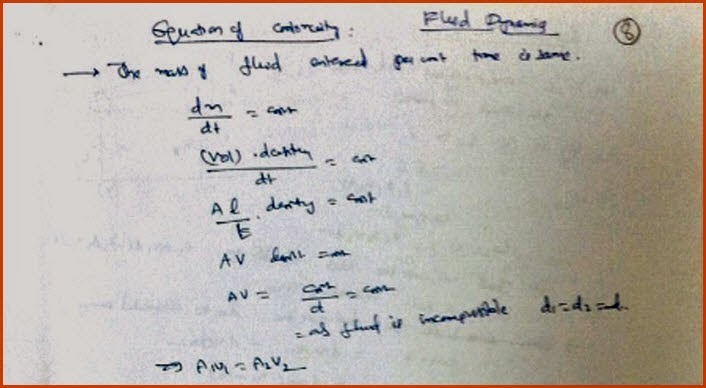 It can be mathematically proved that as per this concept the area of the cross-section of the fluid flow is inversely proportional to its velocity. If the area of cross-section is more velocity is less and vice versa. It can be quite easily observed in daily life also. If the opening of a water tap is completely opened, water comes out with a certain velocity. If half of its opening is closed with the finger we can quite easily noticed that water is coming with better velocity. 4. All particles of the fluid are having the same velocity is when they are passing a particular point. This is nothing but law of conservation of energy. Being a fluid it has not only potential and kinetic energy, it is also having pressure energy. The total of all the energies is always constant. If any one energy increases is obvious that the other energy decreases so that the total energy always remains constant. It is similar to law of conservation of energy that the energy is neither created, nor destroyed it just converts from one form to another form. 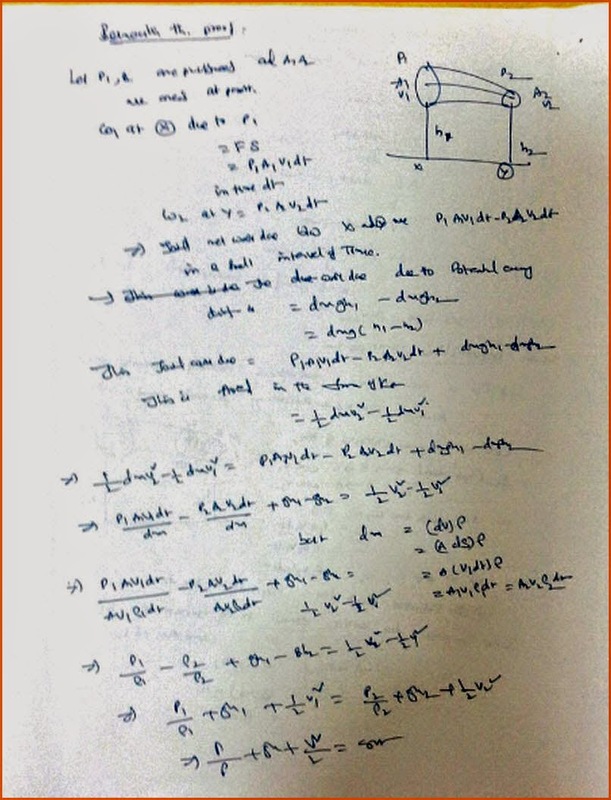 We can prove this theory basing on the concept of work energy theorem. It simply states that the work done is equal to changing its energy.We have further derived it in the following diagram that changing kinetic energy is equal to sum of difference in potential energies and pressure energies.